Why I dropped my CSA membership. Tomatoes and garlic from our CSA share. I was a CSA member for 3 years. I first sought out a CSA program when I lived in a house with no garden plot. I had read about CSA programs in a magazine and thought that sounded like a nice alternative to the grocery store. The CSA I choose was certified organic, and included strawberry and tomato picking in the share. Organic chickens could be added as an option. There were multiple pick up locations… I choose to pick up right at the farm which was about 20 minutes from my house. I was very impressed the first year of the CSA. Our boxes were filled with so many great things, many varieties were new to me. I had so much fun cooking with these fruits, veggies and herbs. There were surprises sometimes too. At the beginning of the season they gave us a Sun Gold tomato plant. During an abundant pepper harvest they set out boxes of peppers, we could take as many as we wanted. There were frozen tomatoes early in the season, preserved from last year’s harvest and just right for a spring spaghetti sauce. I enjoyed the surprises so much. For two more years I subscribed to the CSA. I saved every newsletter they sent me, trying the suggested recipes and soaking in all the great information. When we moved, we continued to subscribe, changing our pick up location to a farmer’s market in the city. Good things continued to come into our home via the CSA. There were some disappointments along the way. 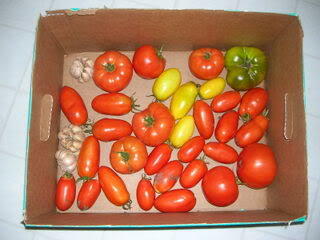 The second year a frost destroyed the tomato crop prior to the self-pick date. We missed out on tomato picking that year. The third year a perfect storm of weather, publicity and timing found us in line to pick strawberries and being told they were all out. As a paying CSA member we felt sort of cheated. By whom, I’m not sure. You can’t predict how these things will go–if the crop will grow, if the weather will cooperate, if people will hear about your farm and show up to pick berries. It wasn’t the strawberry event that led to our ultimate decision to part ways. But in some way I’m sure it contributed. 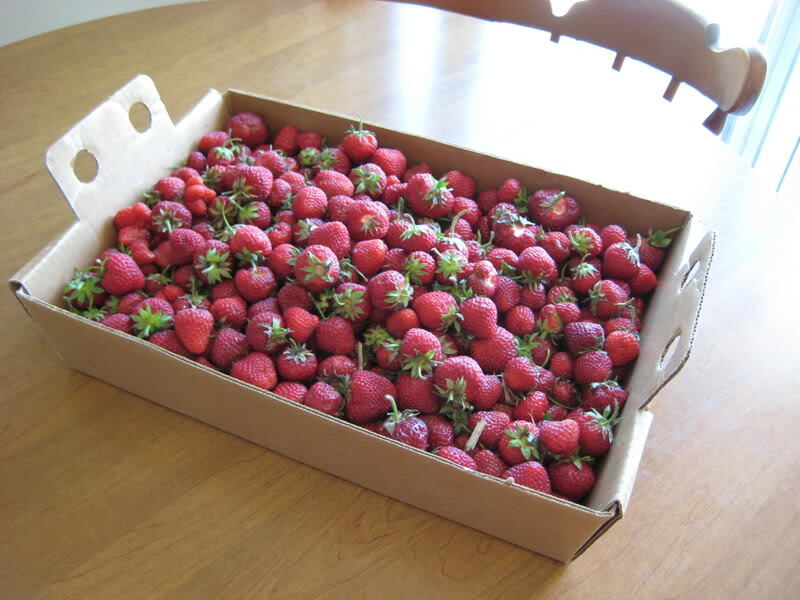 Beautiful organic strawberries from our CSA. One year we got so many brussels sprouts (something my stomach can’t handle) and cauliflower (my husband won’t eat it) that we became the crazy people of the family, trying to pawn off veggies we didn’t want on unsuspecting relations. I have a short list of other things my stomach won’t accept–green peppers, zucchini, mushrooms–even though I would eat a mountain of these things if I could. When we’d get these in our CSA box I’d just have to sigh and prepare them for my family, feeling a bit left out. Perhaps the turning point came when I realized that if I put even half the money we spent on the CSA into my home garden I could produce just as much food and none of it would have to go to waste… or relatives. Besides, I loved gardening. And now I had a wealth of knowledge from my years of preparing food from my CSA box, reading the newsletters and visiting the farm. In a way, the experience of doing the CSA led me to stop doing the CSA. I had gleaned what I could and was ready to move on. I felt a little bit like one does when it’s time to switch to a new hair stylist. It’s a bit awkward. When you see the person after the split has become official you feel like you might need to explain. I was honest with my farmer, and also promised I’d be back at the farm stand for strawberries in June and other favorites throughout the season. Still, I felt a little tinge of guilt about leaving our CSA. And I knew I’d miss it a little bit. Sometimes severing ties is the best way to move forward. When we say no to one thing we are free to say yes to something else. The money saved from the CSA was put into our home garden and the results continue to amaze me. We harvest plenty of food from our garden, but now we also get the satisfaction of growing it ourselves and the joy of living with a garden. Now I grow things I can eat, that my family loves, that relatives don’t mind receiving when the harvest is more than my little family needs. It’s for the best. But I wouldn’t take way those three years of CSA eating. It was delicious, educational and fun. Not to mention nutritious! I found my CSA by searching Local Harvest. 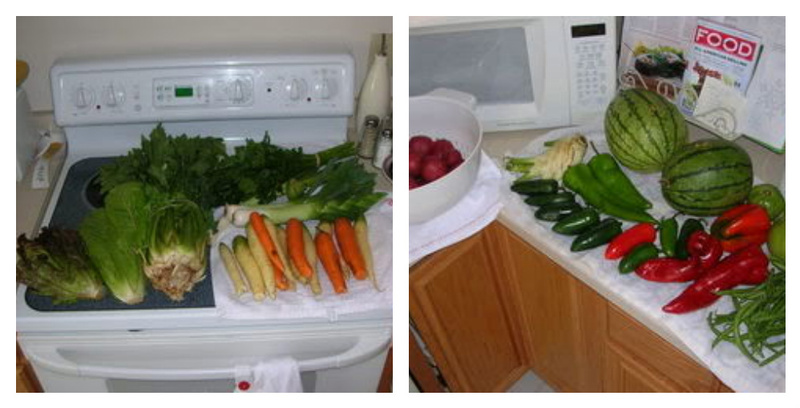 One week's CSA haul in 2007.